New Delhi: Though India is not in a hurry to consider the Chinese proposal to have a free trade area among Brics nations, the five emerging economies will sign an agreement at the upcoming Goa summit for better customs cooperation with an eye to reduce non-tariff barriers among the nations. Brics comprises the five emerging economies of Brazil, Russia, India, China and South Africa. China’s ministry of commerce (MoC) on Sunday said a free trade area would be a “significant form of cooperation” between Brics nations, the state-run China Daily reported. MoC spokesperson Shen Danyang at a press briefing said that by setting up a free trade area, Brics countries would be able to remove tariff and non-tariff barriers, give play to their comparative advantages, and advance trade and investment liberalization among them. India’s commerce minister Nirmala Sitharaman, however, on Monday said she is not aware of any such proposal. Brics trade ministers will meet in New Delhi on Thursday ahead of the 8th Brics Summit meeting in Goa on Saturday and Sunday to discuss global economic trends and their influence on Brics trade and investment. A commerce ministry official, speaking on condition of anonymity, said that agreements on developing a portal for small and medium enterprises as well as one on non-tariff measures are expected to be signed in Goa. “A Brics portal on non-tariff measures will be developed. This is meant to encourage better understanding of non-tariff measures of each country among exporters,” a commerce ministry official said. Another agreement on cooperation on e-commerce which will lead to only information exchange in the area may also be signed. 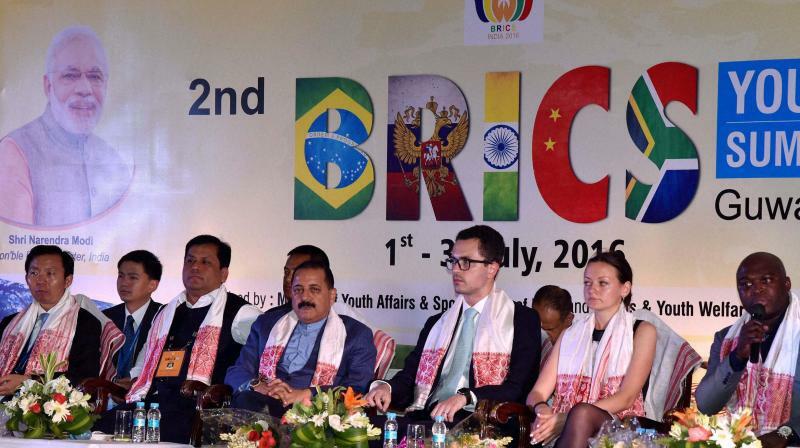 The official said the ministry’s proposal to come out with a travel card for easier visas for businessmen and tourists among the Brics nations did not take off as the Union home ministry is not very keen on it. Brics exports to rest of the world amounted to $3.48 trillion in 2014. Between 2006 and 2015, intra-Brics trade increased 163%, from $93 to $244 billion. The acronym Bric was first used in 2001 by Goldman Sachs in their Global Economics Paper, “The World Needs Better Economic BRICs” projecting that the economies of Brazil, Russia, India and China would individually and collectively occupy far greater economic space and would be amongst the world’s largest economies in the next 50 years or so. As a formal grouping, Bric started after the meeting of the Leaders of Russia, India and China in St. Petersburg on the margins of G-8 Outreach Summit in 2006. The grouping was formalized during the first meeting of Bric foreign ministers on the margins of UN General Assembly in New York in 2006. The first Bric Summit was held in Yekaterinburg, Russia, on 16 June 2009. It was agreed to expand Bric into Brics with the inclusion of South Africa at the Bric foreign ministers’ meeting in New York in September 2010. Accordingly, South Africa attended the third Brics Summit in Sanya, China, on 14 April 2011.